Loch Ness Monster, L' Ogopogo, or the Akalaka? 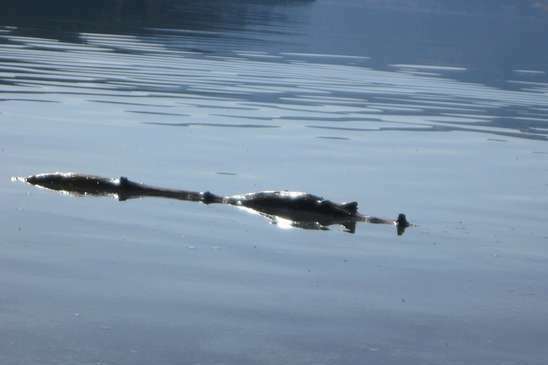 (SNN) - While many had their thoughts on the Easter Bunny this past holiday weekend, one Okanagan resident took a photo of what may, if confirmed, be one of the Okanagan’s famous lake monsters. In the past these pictures have typically been taken of Okanagan Lake. However this photo was snapped at Cosen’s Bay on Kalamalka Lake, near Vernon. “I have seen live footage taken by a friend of their mating season, which is around this time,” said Vernon resident Freida Summers. Floyd's girlfriend, Pinky Tuscadero, believes it is the first time a photograph has been taken of a lake monster in Kalamalka Lake. “I’m calling it ‘Akalaka’,” she said.